If more people played chess, or if they applied what they know of chess when they make investment decisions, their success rate might be higher. Here’s another: Vacancy rates for commercial real estate of a given type reach a low point, so rents rise. Builders, developers and investors observe that fact, and they bring more commercial real estate of that type to market. The only problem from their point of view is that most of them make the same decision, so far too much new space is developed. It’s much more than the market can handle all at once, rents drop, and owners compete for tenants with concessions. A specific instance came to my attention recently, when two competing owners of storage facilities in a given community realized that they were not meeting the local existing demand for rental storage. So, each one made a reasonable (but wrong) decision: each one built a large amount of new supply to meet the demand, and the combination of the large supply created by each drove prices down to the point that the debt they’d undertaken was no longer sustainable. Each one had ignored the other. Much the same error is at work when banks "extend and pretend" that their troubled loans are okay, in hopes that the economy will turn around and rescue both borrower and bank. The problem is that when most banks make the same decision, they delay the correction in prices that will be necessary for a turn-around to occur. What is at work here? It is that each participant in the market acts as if in isolation, without taking into account what other market participants are doing. They are engaging in static thinking; that is, they assume that while they are making a different decision about what to do, most of the other market participants will keep doing what they were doing, and won’t be making the same change. The federal government’s revenue projections generally make the same mistake. When a change in the tax rates is being considered, the government’s economists forecast the effect of the change, by assuming that taxpayers will not change their conduct accordingly. However, because taxpayers are not dunces, taxpayers don’t sit on their hands when tax rates change. Taxpayers do change their conduct, so the government’s forecast of revenues almost always turns out to be nowhere close to reality. It is a failure to think dynamically: to realize that the market will change because of the millions of calculations that participants make more or less simultaneously—and more or less alike. 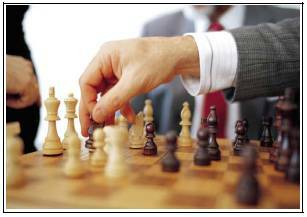 Chess players learn to calculate at least two moves ahead, and participants in today’s market should do so, too. At the least, they should think this way: The market in which I work today is in "x" condition. All of us who work in that market know that. Most of us are likely to calculate that the best way to respond to "x" is to do "y". When nearly everyone does "y", the market will change to "z", which will be quite different from what it is now. In a "z" market, my best move would be __________, so I’ll plan for that now and be ahead of everyone else.